Surface treatment technology is essential with respect to everything from the field of semiconductors and FPD devices to various other fields. At Kuritec Service, our approach to surface treatment involves techniques such as thermal coating, plating and anodizing, which lends new properties and functions to surfaces, geared to enhancing durability, reliability and quality with respect to system and components that are used in the field of semiconductors and FPD devices. We conduct surface treatment through the practical application of cleaning technologies. For example, we make highly water-repellent materials hydrophilic through the use of plating and pre-painting processing, and we adjust surface roughness by roughening or polishing the surface. As an addition to precision cleaning, we perform, for example, passivation coating processing for stainless steel components and materials, thereby strengthening corrosion resistance and wear resistance. With etching technology adapted from precision cleaning technology, we remove the deteriorated surface of parts to create a clean surface condition, and then perform recoating, etc. In the sulfuric hard anodizing generally used in semiconductor processes, corrosion resistance and the numerous cracks that occur from heat stress are matters of concern. Our company has solved these problems with our high-performance hard anodizing, MIC Coat. 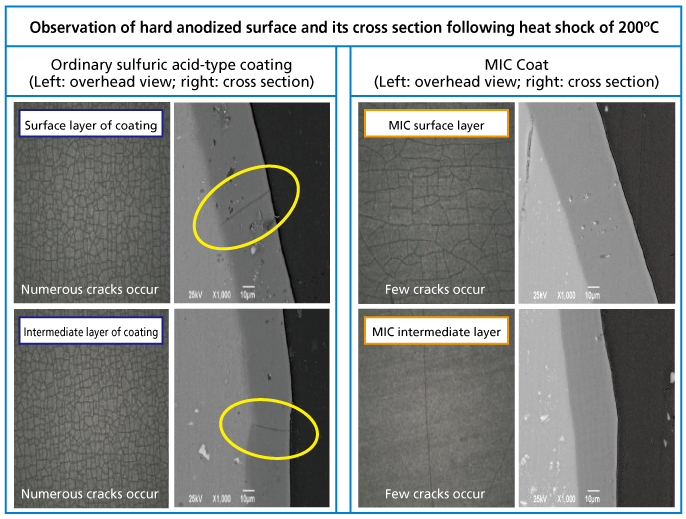 Intended to reduce dust and extend the life of parts, MIC Coat is high-performance hard anodizing that improves crack resistance, corrosion resistance, coating thickness, and other properties.